Can’t get enough ham in your life? Well, this prosciutto pasta recipe is for you. Much like tortellini, cappelletti is the same shape and is filled with a meat or cheese. 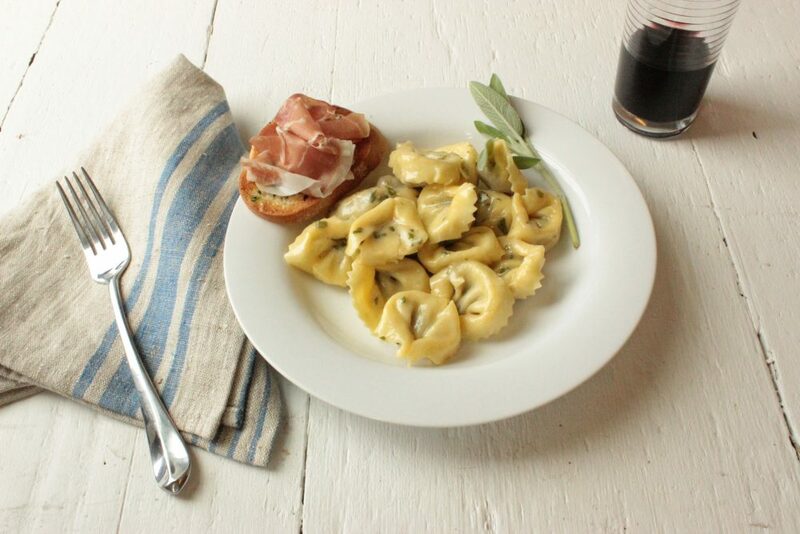 With the prosciutto-stuffed cappelletti and a side of prosciutto on bread, this dish is creamy and rich but not too heavy – satisfying all of your taste buds. Pair this prosciutto pasta with a slightly sweet Pino Grigio and bring home the taste of Italy without even having to leave the house. Arrange bread slices on a rimmed baking sheet; brush both sides lightly with olive oil and sprinkle with parsley. Bake bread until golden brown, 10 to 15 minutes, turning once during baking. Set aside. Bring a large pot of salted water to a boil; add cappelletti. Cook about 3 minutes or until cooked al dente. Meanwhile, in a medium skillet combine butter and broth. Cook, stirring over medium heat until butter is melted and mixture is creamy. When pasta is ready, mix it into the sauce. Add sage and Parmigiano-Reggiano cheese. Top each toasted bread slice with a slice of Prosciutto di Parma to make a crostini. Serve pasta with crostini on the side. Top with additional cheese, if desired.